Three of them is a series of 5 short stories written by Arthur Conan Doyle first published in The Strand Magazine from april to december 1918. 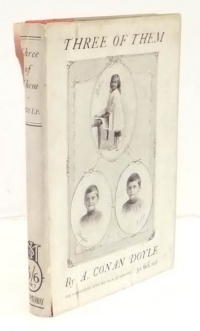 The 5 stories where collected as Three of Them by George H. Doran Co. the same year. 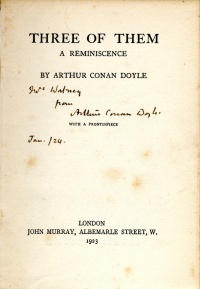 On 2 november 1923, John Murray added two other short stories Billy Bones (1922) and The Forbidden Subject (1923) to the five, with an introduction written by Arthur Conan Doyle. This little book is an attempt to catch some of the fleeting phases of childhood, those phases which are so infinitely subtle and have so rare a charm. No imagination can invent them, and the only task for the chronicler is that of selection. There is a phrase in these dialogues which is not drawn from life. If it be objected that there is nothing remarkable here, and that any three children present the same general characteristics, the writer would not dispute the justice of the criticism, but would rather infer that he had succeeded in his attempt to produce an unexaggerated account of the most beautiful period of human development where thought is frank and fresh. I am prepared to believe that England is full of even such children, and that those who love them may welcome an attempt to picture them as they are. Several of these sketches appeared some years ago at the conclusion of a volume named "Danger." With the addition of the new matter, they now form a homogeneous little record. This page was last edited on 20 May 2017, at 16:58.